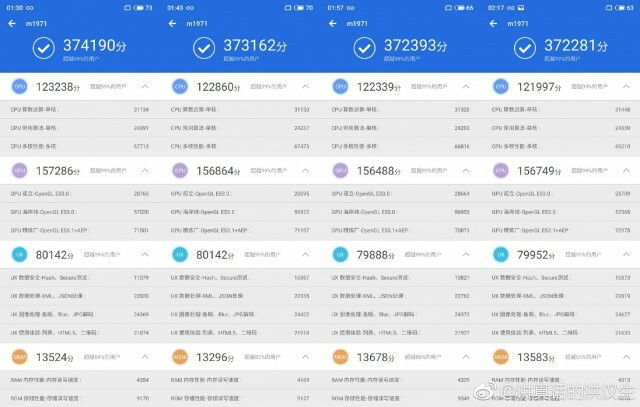 The Meizu 16s had another go at AnTuTu and this time it posted a higher score, making it one of the best-performing Androids. Theres about a 5% improvement since last time, which suggests the team is still working on the software for the phone. Whats interesting is that the new score was posted by Hong Hansheng, who is a system engineer at Meizu. He posted several runs too, the phone shows fairly consistent performance (we picked the top score, just as we do for our own benchmarks). Heres how it compares to other devices with Snapdragon 855, Kirin 980, Exynos 9820, as well as Apples latest chipset. Note that we included two phones that are yet to be released (the Zenfone 6 and Reno 10x zoom). The phone is expected to have the roughly same design as the Meizu 16, though the screen goes from 18:9 to 18.6:9, suggesting there might be some changes (the resolution is 1080p+ in both cases). The screen diagonal will go from 6.0 to 6.2, but 3D renders show no notch. Benchmarks have revealed 6GB of RAM and 128GB storage, plus Pie-based Flyme 7 software.